Time to party, Los Alamos! 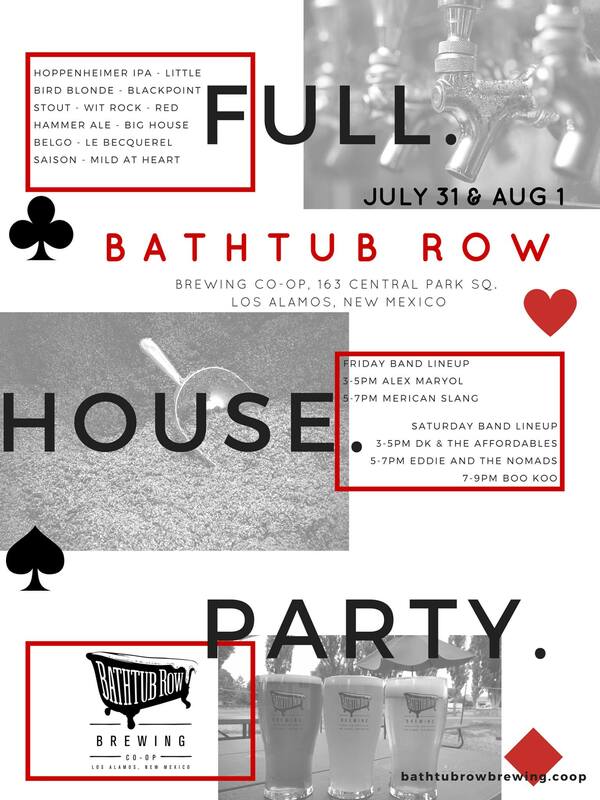 Bathtub Row Brewing in Los Alamos is about to achieve yet another milestone. All of their taps will finally be serving home-brewed beer this weekend. Though the place has been open for months now, they’ve had to supplement their own limited number of brews with those from nearby breweries, including Santa Fe Brewing and Bosque Brewing. They’re certainly not Bud, Bud Light, or Bud Extra Light Gold Lite, so no one was complaining, but it feels good to finally have a full of array of homemade styles to choose from. To celebrate the achievement, BRB will be having a two-day “Full House Party” this Friday and Saturday, with bands and food trucks also in attendance. The taproom will have its normal operating hours both days, noon until 11 p.m. The schedule for bands and food. I’ve seen some of these artists at the Pajarito beer festivals and other places, and they are talented. I’m sure that the food truck vendors are talented artists in their own right, too.